Locked to 40 FPS by default. No ability to resume an online match in the event of disconnect. Combines several mods into one package, adding numerous options for player skins, team colors, and team logos. Optimizes and improves almost every texture in the game and defaults the game to 60 FPS. 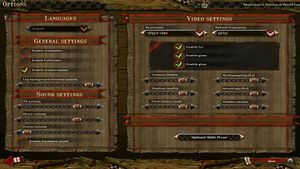 Only players using the mod or variations of it can see non-standard options in online multiplayer. 4x in-game maximum. 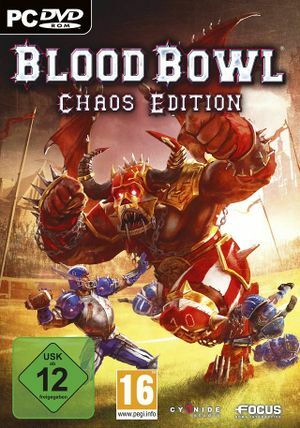 Can be forced via <Anisotropy> in BloodBowlChaos.xml or graphics card control panel. 4x MSAA in-game maximum. Can be forced via <Multisampling> in BloodBowlChaos.xml or graphics card control panel. Music, Sound, and Voices. Spectator voices cannot be lowered without mods. ↑ 2.0 2.1 File/folder structure within this directory reflects the path(s) listed for Windows and/or Steam game data (use Wine regedit to access Windows registry paths). Games with Steam Cloud support may store data in ~/.steam/steam/userdata/<user-id>/216890/ in addition to or instead of this directory. The app ID (216890) may differ in some cases. Treat backslashes as forward slashes. See the glossary page for details.